Trout Lake Nature Center was founded by volunteers and continues to rely on volunteers for most of its activities. With only 2.5 staff members, much of the work done at TLNC is done with the help of volunteers. Our volunteers bring a multitude of skills and life experience, along with passion for the environment, and enthusiasm and willingness to do what it takes. People volunteer for a variety of reasons such as meeting like-minded folks, learning in-depth or behind the scenes information, staying busy while doing something that matters, or to complete community services or scholarship requirements. No matter your reason for volunteering, there is an activity that will suit you at TLNC. We welcome new helpers and there are a lot of activities to choose from. Thorough hands-on training is provided. Fill out our Volunteer Form Here. 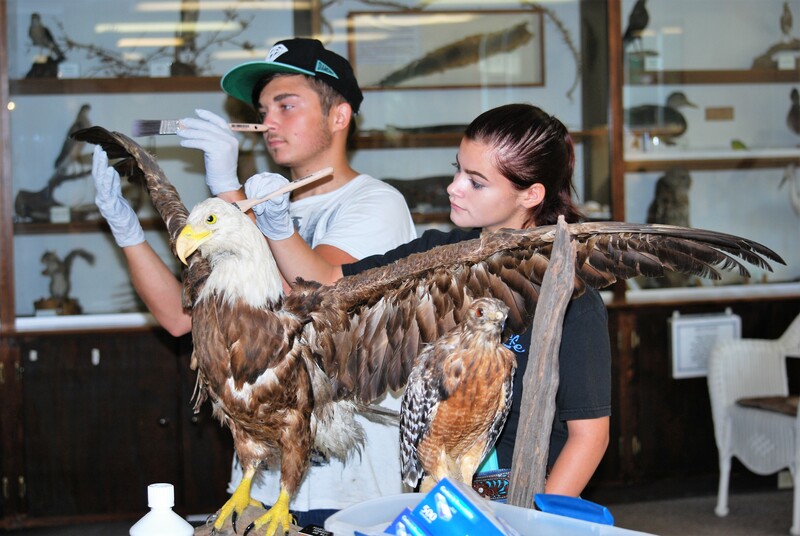 Critter Care: Assist with the care of the live specimens and maintenance of their habitats. This could include feeding, cleaning or regularly handling the animals to keep them used to people. Education: Work with school groups in Lake County teaching environmental education and stewardship of our resources. Work with community and adults to educate them about the wonders of Florida and its natural ecosystems. Teach about how everyone can have an impact and make a difference. Events: Staff educational booths at community events and share TLNC’s mission with others. Encourage children and their parents to learn about Florida’s natural resources through hands-on activities. Offer information about animals, plants, reptiles and more. Fundraising: Work with staff and TLNC Board to develop, organize and conduct fundraising events or activities. Assist in finding various sources of funding and income. Assist with writing grants. Graphic Design: Develop graphics for use in a variety of digital media. Layout publications, kiosks and displays. Assist with development of presentation materials. Greeter/Open Hours: Welcome visitors, staff buildings and display areas and share information about Trout Lake Nature Center—its trails, displays, wildlife and programs—with others. Habitat: Enhance habitat for wildlife on Trout Lake property. Help eradicate invasive plants. Create and maintain open areas or meadows. Hospitality: Plan, shop, cook, set up and clean-up for special events and activities at TLNC such as Friday Night Naturalist programs, volunteer meetings, festivals or celebrations. Interpretation/Information: Help create and maintain TLNC’s kiosks and information areas. Maintenance: Assist with maintenance of trails, facilities and roadways. Work includes trimming vegetation, mowing and weed eating grassed or vegetated areas, repairing roads, and maintaining buildings and equipment. Membership: Assist in maintaining membership records, sending dues notices and recruiting new members. Office/Administrative: Assist with office tasks such as copying, filing, setting up phone tree, logging volunteer hours and other data entry. Photography/Video: Taking photos at TLNC events and programs for use in brochures, kiosks, displays, website, Facebook, etc. Technology/Social Media: Assist TLNC in upgrading technology, establishing and maintaining an electronic presence, etc. Website: Provide additions to existing website such as species database, interactive material, video clips, etc. Writing: Assist with developing written material for press releases, website, online entries, background and promotional information, flyers, newsletters, grants, kiosks and other needs. Other: A wide variety of skills can be used to help TLNC. Let us know about any special skills or knowledge you have.